Connect the dots to more community, more engagement, and more donations. The key is artificial intelligence. 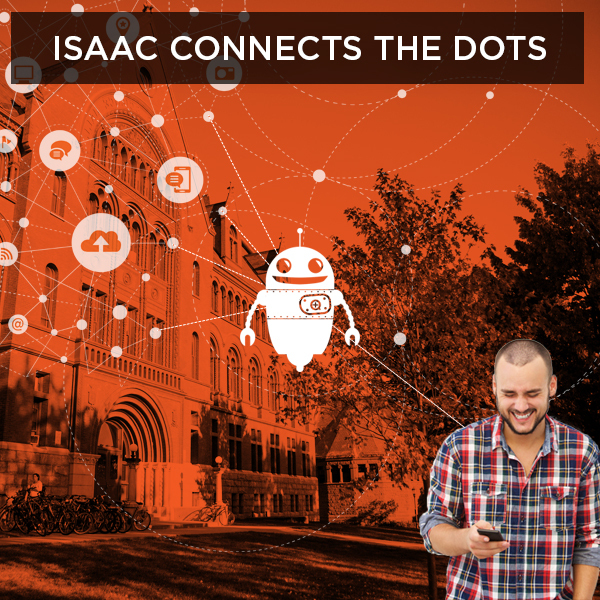 Isaac, the world's first alumni AI, connects the dots between social media, alumni databases, and marketing automation to create individual marketing programs for every single alumni user. Don't believe us? See for yourself in Chicago. Schedule some time with QuadWrangle's Nick Zeckets and Ken Keefer or drop by our booth. You'll see why schools like Georgia Tech, the University of Southern California, and the University of Alabama-Birmingham have come to believe in Isaac and QuadWrangle. Can't find the time? Schedule your own online personal demo for before or after Summit 17. You might even qualify for an Amazon Echo Dot. Send us an e-mail for more details. Keep checking back for daily blog updates from AASP Summit 2017 from CEO Nick Zeckets. You can also follow us on Facebook and Twitter for more updates. We're about to land in Chicago for AASP17 and decided to analyze keynote speaker Jennifer Mulholland's social data to curate one of our partners, UAB's, content for her. See Isaac in action in this post. Guest blog by David Lawson, author of "Big Good"
The word artificial does not invoke warm and fuzzy feelings. From sweeteners with an after-taste to Christmas trees that are a little too green, you know it is not the real thing. Given this, it is not surprising artificial intelligence is not being welcomed with open arms by fundraising where the human touch is seen as critical to success.